After writing many posts about the Wheelsport Fantasy mini velo, I feel that it is time that I write a summary of all the challenges that I encountered while building up this bike from scratch. At the same time, I will also show how I managed to work around each of the issues or solve them. 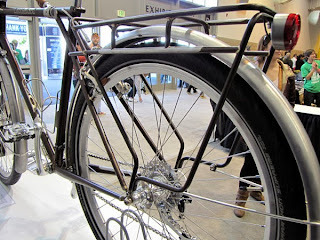 This will be helpful for those who are also thinking of building their own bike up from scratch. I have built two Wheelsport Fantasy mini velos. The first is the red and black themed, 2x10 speed mini velo that belongs to my friend, while the second one is the 2x11 speed matte black mini velo that is my own. The details of the builds can all be found at this page here. All together, I have identified eight main issues that I encountered during the building of the bike. Most of the issues are not a problem with the design of the bike or the components, but with the challenges of building something less common, such as a mini velo with Di2 components. 1) Using a 406 wheelset in a bike frame designed for 451 wheels, and 74mm front hub width in a frame designed for 100mm front hub width. 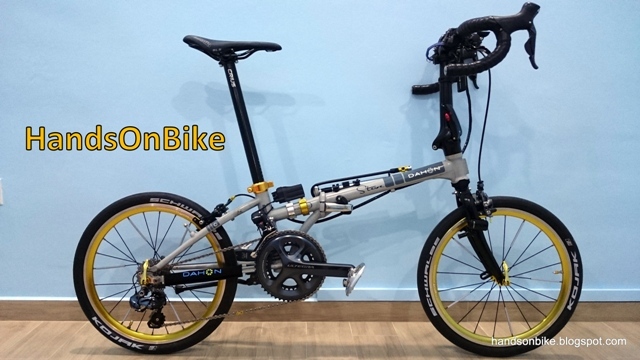 Another issue with this is that the custom gold wheelset has a front hub width of 74mm (for Dahon and Tern folding bikes), while the Wheelsport frame requires a more standard 100mm front hub width. To solve this, a 74mm to 100mm front hub adapter is used to fit the wheelset to the frame. Using the Elosix front hub adapter, to convert the 74mm front hub to a 100mm width to fit the Wheelsport Fantasy front fork. Although having the adapters is not as good or strong as having a proper 100mm wide front hub, I did not detect any flex or play while riding the bike, which is good. This can be a viable solution for those who need to install a 74mm wide front hub in a frame for 100mm front hubs. Another effect of using 406 sized wheels in a frame designed for 451 wheels is that the wheel rims are further away from the brake mounting points. Extra long reach Tektro R559 caliper brakes are thus required to let the brake pad reach the rims. With these extra long reach brake calipers, it is possible to use 406 sized wheels in a frame designed for 451 wheels. This is not an ideal case, but it will work if you want to continue using your 406 wheels. During installation of the stem to the top of the fork steerer tube, the long carbon spacer is needed to let the stem press down on the headset. I found that the stock length of the carbon spacer is too long, and thus I needed to cut short the carbon spacer. However, I found that using a pipe cutter to cut the carbon spacer is difficult, as the carbon spacer has thick walls. Also, the final edge is not smooth, and needs to be filed to be flat. On hindsight, I should have used a proper cutting jig and a carbon saw to cut the carbon spacer. As I installed the Ultegra 6870 Di2 groupset onto this bike, there is a need to install a Di2 battery on the frame. I considered getting an internal Di2 battery to fit inside the seatpost, but due to the lack of wire access holes on the frame, it would be very difficult to run the wires properly. Therefore I used a standard external Di2 battery for the system. The challenge is to find a suitable place to install and fix the battery and battery mount. After some trial and error, a neat place to install the Di2 battery would be near the BB area, below the bottle cage. However, there is no space to fit both the Di2 battery and the bottle cage, unless the bottle cage is moved upwards. The solution is to get a Shimano bottle cage adapter to move the bottle cage upwards to make space for the Di2 battery. By moving the bottle cage mounting point upwards, it makes space for the Di2 battery, and also for a second bottle cage mounting on the seat tube. With the use of a special bottle cage mount, a new bottle cage mounting point can be created on almost any part of the bike, provided there is sufficient space. This will be used on the seat tube to create a second bottle cage mounting area. Just enough clearance within the triangle of the frame to fit a water bottle, a Di2 battery and a tool bottle. With this second bottle cage, a tool bottle can be used to carry the spares and tools for the bike, eliminating the need to have a saddle bag. This gives a neater look at the seat post area, and also frees up the seat post to use the Fly 6 rear camera + rear light. During the installation of the front derailleur (FD), I found that the chain would rub against the bottom of the FD chain guide in certain gear combinations. Upon further investigation, it was found that the FD mounting bracket was not designed to accommodate the different chain stay angle of this mini velo frame. For more details check out this link. My solution for this is to use a series of spacer and angled shims to move the FD backwards, and also tilt it to the correct angle. With this setup, the FD shifts well with no chain interference issues. I have seen the latest 2016 Wheelsport Fantasy mini velo frames, and the FD mounting bracket has been moved to the correct location after receiving customer feedback, which is good to see. Another side effect of using 406 wheels in a frame designed for 451 wheels is that the overall ground clearance will be lowered, due to the smaller radius from the wheel axles to the outer circumference of the tires. The worry is that during cornering, we may experience pedal strike if the crankarms are not positioned properly to avoid touching the ground. From the comparison, the Wheelsport mini velo with 406 wheels has the least ground clearance. The good news is, during my rides, I have tried to initiate pedal strike by cornering and also pedaling at certain critical areas, but it did not happen. This means that even with the lower ground clearance on this mini velo, pedal strike is not an issue to worry about. Finally, after testing out the bike for a few weeks, I realised that the braking performance is not good enough for me. This is mostly due to the extra long reach brake calipers which have less braking power than standard reach brake calipers. The only way to improve braking performance is to use standard reach brake calipers. In order to do that, I would have to use 451 sized wheels, which is what I should have done in the first place, had I known that it would create so much extra work and compromises by using 406 wheels. It was a good learning experience, but for ideal performance, 451 wheels should be used for this Wheelsport Fantasy frame. Therefore, I ended up changing to a Wheelsport Smart 1.0 451 wheelset, along with the excellent Ultegra 6800 caliper brakes. The tires and inner tubes also had to be changed to 451 sized. With this upgrade, the braking performance has improved greatly, and the whole bike rides and feels really good. Great shifting and braking performance, and is also lightweight and fast.